As queer communities strive to embrace intersectional politics, those with a disability or functional diversity are often left behind. 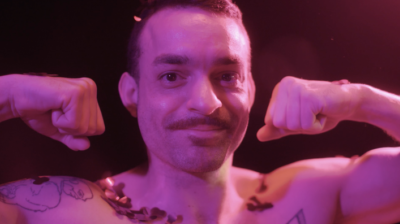 This programme presents an exciting selection of work by and about functionally diverse filmmakers exploring the intersections of queerness and disability. Followed by a discussion with guest speakers to be announced. Content note: discussion of violence, including sexual violence. Ticket prices are on a sliding scale. Choose between free, £2, £4, £6, or £8 depending on what you can afford. No proof of your situation will be asked for. To book, please use the button below or call CCA box office on +44 (0)141 352 4900. To request travel costs, book a beanbag or a seat in the front row or if you have any questions about access, please contact Helen on helen@sqiff.org or by calling or texting 07735 273 245 (if calling, please do so Monday to Friday between 9am and 5pm). SQIFF volunteers will be available during the event if you have any questions or anything we can help you with. Part of a Queer Film Network (QFN) tour. QFN is a strategic Film Hub Wales project and receives support from the BFI Film Audience Network.